Make all your DIY dreams come true! Lazy Dog Warehouse now offers a high-quality Neoprene Foam Roll in a variety of thickness sizes for all your customization needs. It can be cut to size, you can apply paint to decorate it, or use a heat gun to mold it to all types of shapes - this material can handle it all. It can be used in indoor and outdoor projects and because it is waterproof - it can withstand all types of weather conditions. Don't worry about any smells - it is a non-absorbent foam material - so it won't hold any bad odors! WATERPROOF & NON-ABSORBENT - Made from Neoprene Sponge Foam, this material is specifically made and designed to repel liquids and odors. Perfect for high traffic areas such as auto, garage, and kitchen areas. PROTECTIVE - The thick dense sponge foam is perfect for providing cushion or padding. Easy and economical solution for sealing or insulation projects. Great for noise insulation and sound vibration reduction. 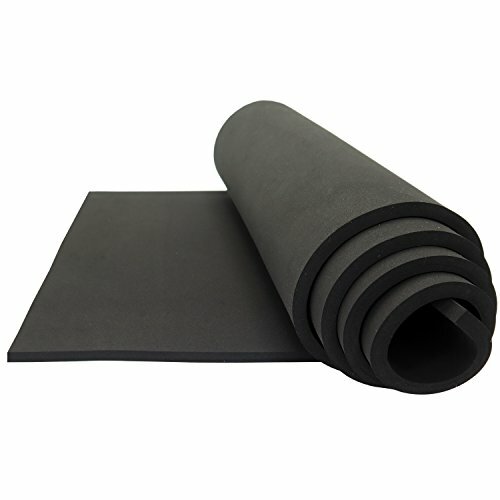 ADJUSTABLE & FLEXIBLE- The Neoprene Sponge Foam Sheet Roll is strong enough to withstand tearing but easy enough to customize and cut to size with scissors or blade. Will bend easily and conform to any shape. DYI & PROJECTS - Use around the home or workplace to provide custom padding or insulation solutions. Use for costumes and cosplay. Great for arts and crafts projects! Solid Black front and back - easy to customize! DIMENSIONS - 15" (inches) Wide and 60" (inches) Long or 5 ft. (feet) Long. If you have any questions about this product by LAZY DOG WAREHOUSE, contact us by completing and submitting the form below. If you are looking for a specif part number, please include it with your message. PSA Neoprene Rubber Sheet Roll Strips 60A Durometer, Smooth Finish, Adhesive Backing, One Side, Black 1/32" .032" 1/16" .062" 3/32" .093" 1/8" .125" 3/16" .187" 1/4" .250" 3/8" .375" 1/2" .500"